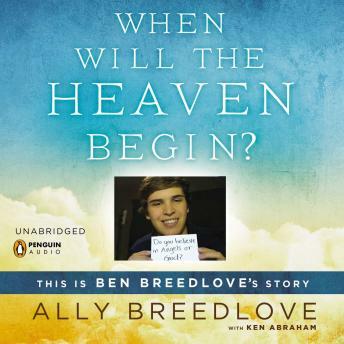 AN INSPIRATIONAL AND HEARTRENDING MEMOIR ABOUT BEN BREEDLOVE, WHO SHARED HIS NEAR-DEATHEXPERIENCES AND VISIONS OF HEAVEN IN HIS VIRAL VIDEOS—WRITTEN BY HIS SISTER, ALLY BREEDLOVE. On Christmas Day 2011, Ben Breedlove’s soul went to heaven. But it wasn’t his first time there. Ben suffered from hypertrophic cardiomyopathy (HCM), a heart condition that posed a constant risk of sudden death. His condition, a thickening of the heart muscle, worsened over time, leaving him weak and fatigued. It also led Ben to some close calls medically, in particular cardiac arrest on four separate occasions, during which he felt the presence of angels and experienced the perfect peace of heaven. Precocious and warm, Ben was close with his family and two siblings, and forged deep relationships with his friends. He loved to wakeboard and wake surf, and he had dreams of visiting foreign countries around the world. He created the YouTube channels TotalRandomness512 and BreedloveTV, and co-created the channel OurAdvice4You, where he posted videos about everything from dating advice for girls to more serious topics like his spirituality and heart condition. Unbeknownst to his parents and family, Ben created a two-part video called 'This Is My Story,' in which he used flashcards to tell the world about his near-death experiences and his beckoning toward heaven. When he died a short while later, at the tender age of eighteen, his family and the rest of the world stumbled upon these videos. The world responded with overwhelming acceptance of the message Ben shared. Sharing his vision of heaven was Ben’s gift to his family, and to the world. And now this is the Breedlove family’s gift to us – an in-depth look at the life and near-deaths of Ben, the strength and faith of a family, and ultimately, the hope of heaven.